With the rise in exploratory frontiers, the increase in rig day rates and costs, and the introduction of new regulatory policies, the demand for innovative technologies has never been higher. To reduce costs and mitigate risks, oil and gas operators need technologies that can enhance drilling efficiency and optimize drilling operations across all phases. 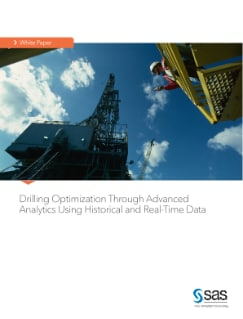 With SAS Visual Analytics, drilling engineers, advisors and asset team members can use intuitive analytic tools to improve understanding of their wells and operations – without being statisticians. And with an easy-to-use interface atop a robust framework of data management and advanced analytic solutions, engineers can ask and get answers to unanticipated questions on the fly.